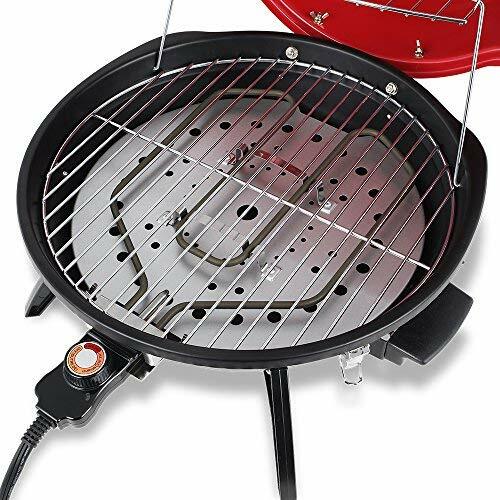 Portable electric grills are popular for people who live in condos, apartments or other arrangements where traditional gas and charcoal grilling is prohibited. The ability to pull up stakes and take it with you when you tailgate or camp somewhere with available electricity is also a nice touch. However, it’s meant to be a table or countertop unit. 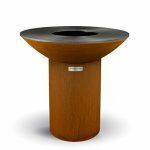 At this time Techwood doesn’t offer any sort of accessory pedestal, stand, or cart. If you use it at high heat for a long grilling session, the counter underneath could get pretty hard, but it shouldn’t be enough to damage anything. Technically, they claim that it’s approved for apartment patios. Just make sure that you check with your building manager and read the fine print on your renter’s insurance policy before investing in the Techwood B07JQBVK9K. The last thing you want to do is blindly assume its okay, only to find out you violated a rule or voided your renter’s insurance coverage. The 18-inch grill grate is pretty spacious, especially when you consider how light the unit it. One other thing to note is that it uses an electrical resistor element instead of a nichrome electric element that you find with some grills in this category. This is a bit of a double-edged sword, in that you get better air movement and aroma. Unfortunately, it also means that you are going to have some hot and cold spots across the total surface area of the grate. When we factor in that it’s a truly lightweight electric grill, with a very friendly price tag, the Techwood B07JQBVK9K has some decent quality in materials. Just don’t expect to get a high-end unit at this low of a price. The drippings tray is a little bit small, and the flimsy warming rack is something they could have left off altogether. The fact that the grill grates are stainless steel isn’t the sort of thing that’s going to knock a star off the rating. A lot of similarly designed grills in this category have the same type of grate. Still, a grate with some sort of protective coating would have this unit a head above the rest. There is very little assembly required with this electric grill. You simply unpack it and put everything in its proper place. It shouldn’t take you more than 15-minutes. The electrical resistor elements that heat the Techwood B07JQBVK9K is one of the major factors in keeping the grill lightweight and portable. However, it also means that there are going to be hot and cold spots all over the place. At certain settings, some areas could be so hot that they burn the outside, before warming the interior of a thick piece of meat through. While cooler areas might not give it the kind of sear you will find from traditional gas and charcoal grills, or high-end electric grills with a nichrome element. With all that in mind, let’s be honest here. You are not going to be interested in this grill because you are perfectly preparing Chateaubriand every Friday night. 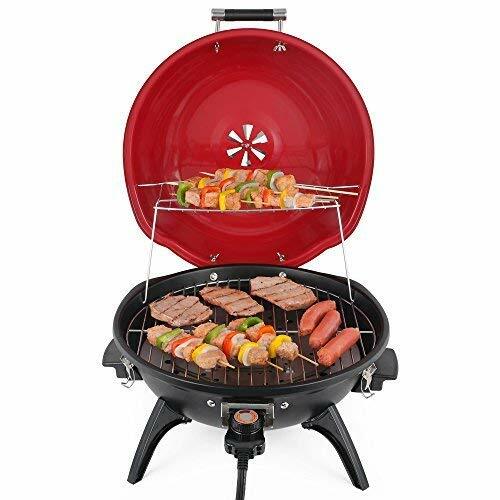 This is a burger and bratwurst type of grill that can eventually cook up a boneless piece of chicken or the odd thin cut steak. 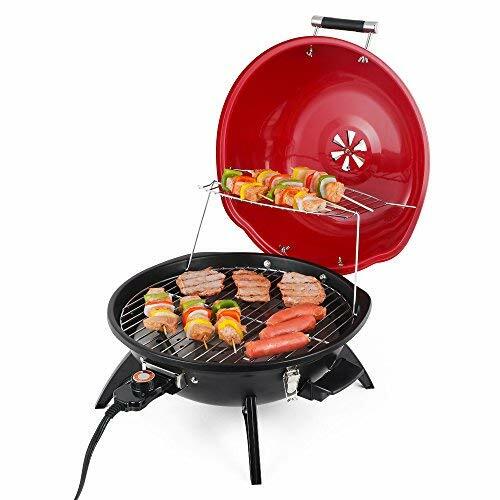 The 18-inch round grill grate provides an impressive amount of size compared to competitor grills in this same category. All told the primary grate rings in at a whopping 240 square inches. This is just a step below what you would get with a 21-inch diameter charcoal kettle grill. Just ignore the puny warming rack’s existence. The adjustable temperature control has a bit more range than you find in some other electric grills. The adjustable damper on top helps a little bit with heat control. Still, this is meant to be a direct heat grill for searing and the occasional medium heat grilling applications. It’s not really the type of grill you are going to use for indirect heating or adding steam. The locking lid is a nice touch for the time when you need to move it from Point A to Point B. The Techwood B07JQBVK9K is a little bit tricky to clean. The contoured electric element can something be a pain in the backside to clean under. If you do need to scrape something away, use a grill brush with nylon bristles. You don’t want to risk using steel wool or a grill brush with metal bristles as it could potentially damage the bare electrical resistor. The grill grate made from stainless steel and aren’t coated with anything. This means they can be a little bit on the sticky side. Giving them a quick wipe down with some olive oil on a paper towel before you place the food on the grate will help minimize sticking and burned-on material. The Techwood B07JQBVK9K comes with a 30-day no hassle return policy, as well as an 18-month warranty. This is a step or two above what you see with similar grills in this category. 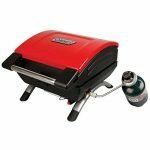 If you live in a condo or apartment where electric grills are allowed on the balcony, then chances are you are in the market for a grill like the Techwood B07JQBVK9K. Just keep in mind that it’s not going to knock your socks off with its versatility. Still, it should be able to handle any kind of direct heat grilling applications that you ask it to do. 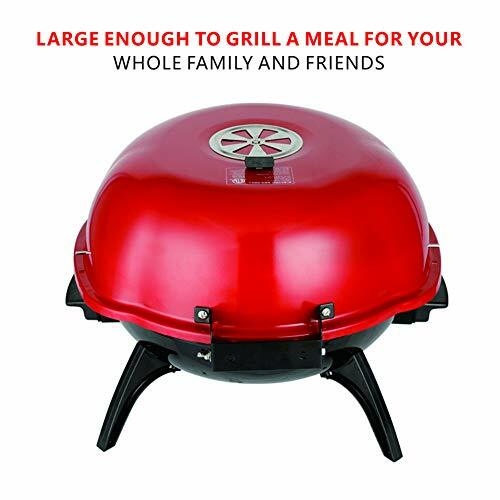 Portable :You'll be grilling everywhere with the convenient interlocking Hood and Bowl. Techwood offer a outstanding 30-day hassle-free return policy & 18-month warranty. We assure you that no other electric indoor/outdoor grill beats our products' high-caliber quality & efficiency. All our products are covered by Product Liability Insurance of United States.